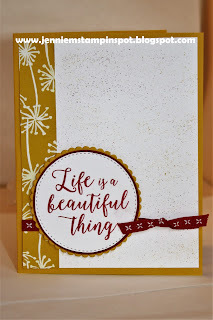 Life has gotten in the way of my stamping time lately but today I got to make this quick card. I used the Case this Sketch#265 here. Colorful Seasons is the stamp set with some Whole Lot of Lovely DSP. I also used the marker flicking technique to add a bit of color to the background. This is so pretty! I love your wonderful take on the sketch!